LOS ANGELES, California, December 6, 2010 (ENS) – Indigenous plaintiffs from the Peruvian Amazon won their appeal today in a human rights and environmental contamination lawsuit against U.S. oil giant Occidental Petroleum, as the U.S. Court of Appeals for the Ninth Circuit ruled that the case should be heard in Los Angeles, where the oil company is headquartered. A district court judge had previously ruled that the case should be litigated in Peru, but the Ninth Circuit disagreed, allowing the plaintiffs to proceed in U.S. federal court. “This is a major victory for the rights of indigenous peoples,” said Marco Simons, legal director of EarthRights International, who argued the appeal before the Ninth Circuit. “Oxy will now face justice in the U.S. federal courts, rather than in a Peruvian legal system that has never compensated indigenous groups for environmental contamination,” he said. The lawsuit claims that Occidental Peruana, an indirect subsidiary of defendant Occidental Petroleum Corporation, harmed the plaintiffs, 25 members of the Achuar indigenous group living along the Rio Corrientes in northern Peru, by their petroleum and oil exploration operations. The Achuar and Amazon Watch, a California nonprofit, sued Occidental in Los Angeles County Superior Court for environmental contamination and release of hazardous waste. “In assessing whether Peru afforded Plaintiffs a satisfactory remedy, the district court erroneously failed to weigh Plaintiffs’ expert testimony, which unequivocally asserts that Peru provides no practical remedy at all for Plaintiffs,” wrote Judge Kim McLane Wardlaw in the majority opinion. The plaintiffs allege that Occidental Petroleum caused them severe injuries by knowingly dumping a daily average of 850,000 barrels of toxic wastewater into the rainforest and waterways over a 30-year period, as well as inducing acid rain from gas flaring, and improperly storing waste in unlined pits. The plaintiffs allege that these practices caused widespread lead and cadmium poisoning, among other serious health impacts. The Achuar case, Maynas Carijano v. Occidental Petroleum, was filed in May 2007 in the U.S. District Court for the Central District of California. In April 2008, the district court ruled that the case should be heard in Peru under the legal doctrine of forum non conveniens. The plaintiffs and their counsel, including Washington, DC-based EarthRights International, the Venice, California firm Schonbrun DeSimone Seplow Harris Hoffman & Harrison LLP, and San Francisco lawyer Natalie Bridgeman, appealed that ruling. 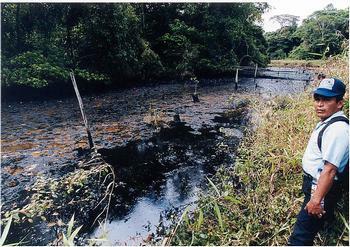 According to “A Legacy of Harm,” a 2007 report issued by EarthRights International, Amazon Watch, and the Peruvian legal nonprofit Racimos de Ungurahui, Occidental’s operations discharged billions of barrels of untreated wastewater into local streams, caused numerous spills and resulted in many unremediated toxic waste sites in Achuar territory.